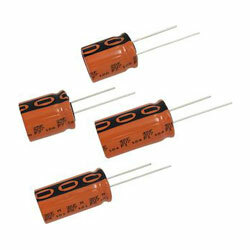 RS Components offers a new range of 225 EDLC-R ENYCAP ruggedised capacitors manufactured by Vishay/BC Components. Intended for energy storage in industrial, renewable energy and automotive environments, the MAL2225 polarised EDLCs merge high capacity and energy density with fast charge and discharge rates. These capacitors are claimed to be the industry’s first to provide a useful life of 2000 hours at +85C and can meet the most demanding moisture resistance qualification: the AEC-Q200 biased 85/85 1000-hour accelerated lifetime test. This long useful life is double that of standard EDLCs, allowing maintenance-free operation and increasing electronic design flexibility. At 20C the useful lifetime is upward of 10 years.